Why is a wine guy writing a blog post about Neil Diamond? It’s not Neil Diamond. 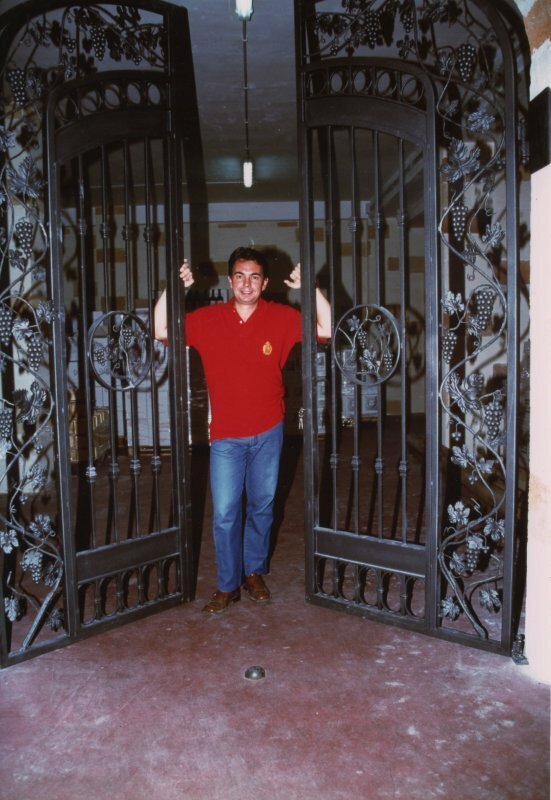 It is his twin look alike Gregory Perrucci, General Manager of Accademia Dei Racemi in Manduria, Italy in the Puglia region. When it comes to Italian Wine, most people think of Tuscany, Piedmonte, Venezie, and Sicily, Italy is shaped like a boot. Puglia is located on the heel of the boot between two seas (Tra due mari in Italian) The Adriatic and Ionian Seas. The Racemes are the second result that some varieties grow. These second-generation fruit ripen at a distance of about 20 days after harvest of the primary grapes are harvested and vinified and therefore at a later time, representing a second chance to improve or even recover the adverse events occurred in the first fermentation. This is the real reason the name Accademia Dei RACEMI as this is a project of passionate people working together to bring dignity to these ancient grape varieties in this region. A little bit about Sussumaniello. This grape variety is one of the most ancient grape varieties dating back to the Roman Time. It was thought to be facing extinction until it was rediscovered in 1998 by this great historian of Puglian vines Gregory Perrucci (A.K.A. Neil Diamond pictured above) When I was in Italy, 2 years ago I visited Racemi and first met Gregory and his wonderful girlfriend Marianna Greco (A Talented Graphic Artist who designs Racemi’s Labels). I love all the ancient varieties that Gregory Produces such as Primitivo, Negramaro, Malvasia Nera, Ottavianello (Cinsualt in France) and Marianna and My Personal Favorite, Sussumaniello or as Racemi calls their bottling “SUM”. Torre Guaceto is a nature reserve and protected area, so while the rest of the surrounding coastline is now home to countless bars, restaurants and hotels, this patch of sand and sea has remained blissfully free from development. This is where Gregory rediscovered “SUM”. I might add this is where Gregory grows Negramaro and I might add this is where Gregory grows the Olives for my favorite Olive Oil (Hint Hint Gregory, I am out Of Olive Oil). 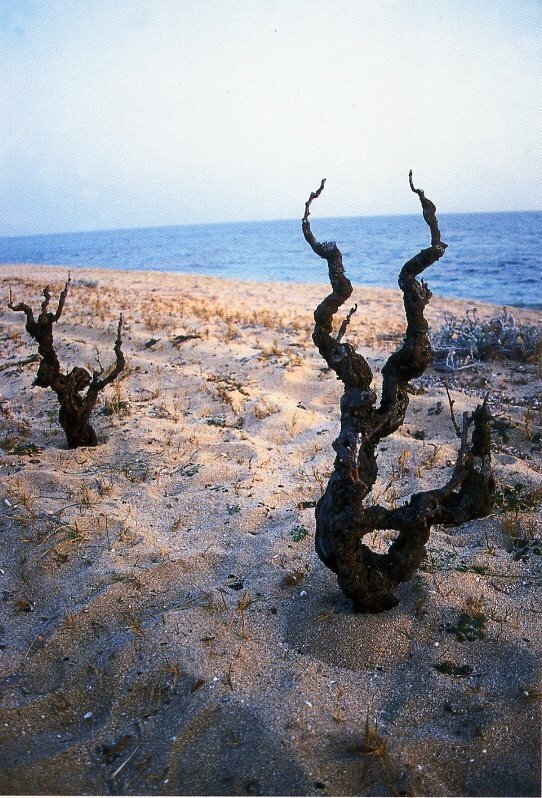 These are the sandy soils in Torre Guaceto. Look at the thickness of these ancient vines. They look like tree stumps. The older the vines have to go into the ground to get their water, the smaller the berries on the vine and the more concentrated flavors you will get out of the grapes. “SUM” is imported in the State Of Florida by Alberello Imports and “The Selections Of Nadia Galati”. I feel like I am being redundant when I mention that name but besides considering Nadia and Her husband Chris friends, I really believe that their portfolio is the best of the best in Italian Wines. Last night I was having some light Greek Food and I just happened to have a bottle of Gregory’s “SUM” pictured above to review. 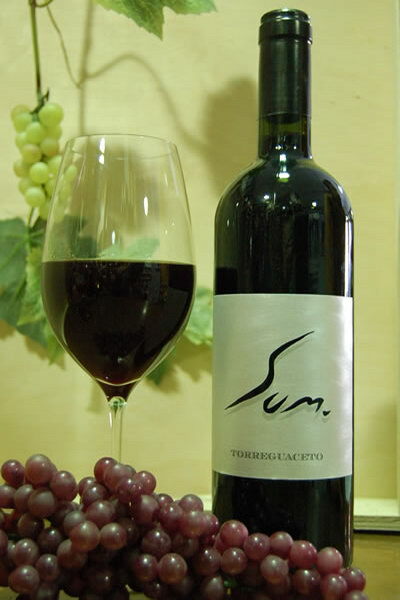 This was the 2008 vintage of “SUM” from the Torre Guaceto Property and it has 13.5% Alcohol. After chilling the wine down to a perfect 60 degrees, I poured and sniffed. WOW, was my first reaction. What a nose! This smelled like someone was crushing fresh grapes right next to me. Beautiful ripe red fruits with a hint of caramel or toffee in the background with a dash of spice. On my palate an explosion of macerated red cherries or kirsch type flavors with a long silky finish. This wine was old vine fruit at it’s finest and I can see why “SUM” is Marianna’s favorite wine that Gregory produces as it is mine too. Anyone can go to a Wine Shop and find another bottle of Cabernet Sauvignon, Chardonnay or Merlot. For Italian wines the marketplace is flooded with Chiantis, Pinot Grigios, Brunellos, Super Tuscans and Barolos. How many Wine shops carry a good assortment of Primitivos di Manduria, Negramaro, Malvasia Nera, Salento Rosso Blends, and where are you going to find a bottle of Sussumaniello or “SUM”? Thank you Gregory for your dedication to bringing attention back to the ancient varieties for wine from the Heel Of The Boot in Manduria, Italy. I suggest everyone reading this blog to seek out these wines at your local retailer and if not available in your local area, you can find these from an internet shipper. Neil Diamond makes some pretty darn good wines that are food friendly and very versatile with all sorts of cuisine. Next time you plan a visit to Italy, don’t leave out the “Heel Of The Boot” and check out Accademia Dai Racemi while there. This is the reason when the Italian Winemakers come to Florida once a year that I give Gregory Perrucci a big Kiss. It is my way of saying…Please Sir Gregory May I have “SUM” More??? Where you see a marked resemblance between Gregory and Neil Diamond, I see their kindred spirits; both with the creative muse to guide them. Long ago Neil Diamond artfully sang of “Red, Red Wine” and Gregory, of his own, makes red wine art. You are right on the money with your thoughtful article. Where Gregory’s wines are concerned truly “I’m a believer”. NextHooked On “ONIX” True Old Vine Fruit In Priorato!